Tangled Up in Q is a new monthly music series created by CLTure and Queen City Q, treating live music lovers to BBQ, cold beer, and local singer/songwriters. 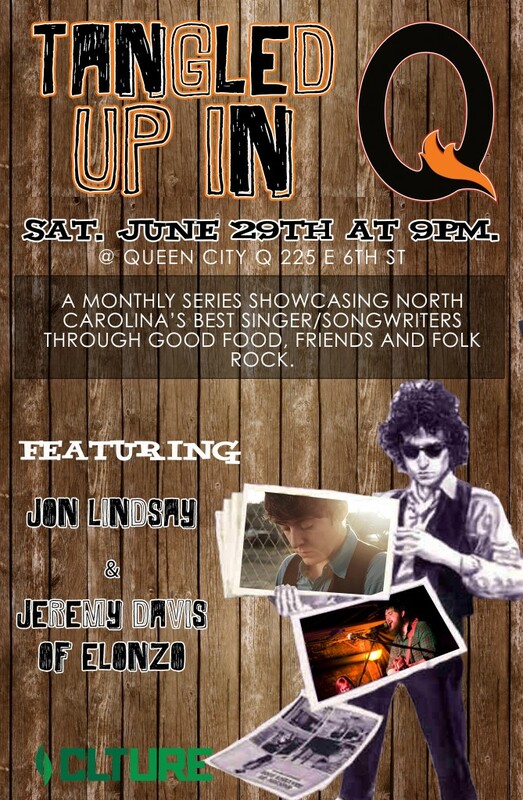 The monthly event will launch Saturday, June 29 at Queen City Q (225 E. 6th Street). The show starts at 9pm w/ a $5 cover charge. Slated to take the stage for the month of June are singer/songwriters Jon Lindsay and Jeremy Davis of Rock Hill-based band Elonzo. Lindsay is an accomplished independent singer/songwriter, multi-instrumentalist, and producer that has laid strong roots in Charlotte. Studying at Queens University and releasing a highly praised indie folk rock debut album that gave a nod to the Plaza-Midwood Charlotte neighborhood has allowed Lindsay to win the hearts of many North Carolinians. With the 2012 release of Summer Wilderness Program and two upcoming albums in 2013 (Cities and Schools and Letters to Randy Newman), Lindsay will grace the stage for the first ever “Tangled Up in Q” acoustic rock performance at Queen City Q. People will also have the chance to win tickets to other area concerts by attending Tangled Up and Q. Queen City Q is giving away two tickets to the Portugal. The Man Concert coming to The Fillmore Oct. 2nd. All attends have to do is suggest a band or an artist for future “Tangled Up In Q” music sessions. Best suggestion takes home free concert tickets. Also, vouchers for the JJ Grey and Mofro concert coming to the Neighborhood Theatre Oct. 11th will be strategically placed around Queen City Q during “Tangled Up In Q”. If an attendee sits in a seat with a hidden voucher, they get free concert tickets. For more information about this event visit the event’s page on Facebook.